The more she investigates, however, the stranger the answers become. And when Sadie learns the eccentric Mrs. Wapple has been attacked in her home, she knows times is running out. As the unexplained occurrences escalate, Sadie finds herself embroiled in yet another mystery with life-or-death consequences. Can Sadie discover whoever — or whatever — is behind the mystery before anyone else gets hurt? Or will this be the last time Sadie takes the case? This book is such a great read, it is perfect for fall or Halloween. I was really surprised how it ended, I love that it was not predictable! This mystery kept me on my toes I could not stop reading. I would recommend this book for sure! Teens and up will enjoy it. Fun. Suspenseful. Great for Halloween. I appreciate that Josi Kilpack keeps sharing her many talents with us. I have thoroughly enjoyed the books that I have read of hers. In "Pumpkin Roll" she keeps you guessing all the time and adds a lot of fun twists and turns, with a surprise ending that leaves you wanting more. I highly recommend Josi's books. Josi has done it again!! I loved this book! I have loved the entire series, as well, and each one seems better than the last! 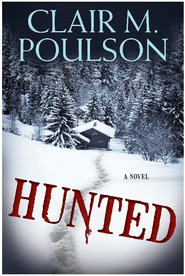 If you are looking for a book to sweep you away into a mystery, then this is for you! I also love having new recipes to try out!!! 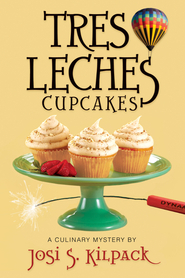 Don't ask me how I have gone so long without reading one of Josi Kilpack's culinary mysteries, but I have obviously been missing out on all the fun. Pumpkin Roll is absolutely perfect for Fall and Halloween! Set in Jamaica Plain, a small township of Boston it is close to heart of the Salem Witch Trials. Things get spooky fast for Sadie and boyfriend Pete who are on vacation together while watching Pete's grandchildren. Between light bulbs exploding, strange faces in the window, night time visitors and the witch across the street who is always digging in her yard, Sadie is sure there's a mystery to be unraveled. In her nosy neighbor way she offers a plate of cookies to Mrs. Wapple and is determined to figure out why she's so strange. But danger lurks around the fence! 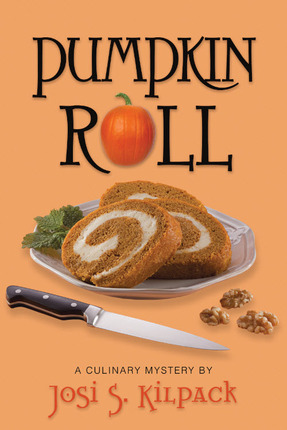 With mouthwatering recipes for cookies, whoopie pies, clam chowder and cinnamon twists, Pumpkin Roll is one you don't want to read while hungry! Sadie will have you itching to bake and trying to put together all the little clues behind this who done it. I thoroughly enjoyed this book and would recommend it to all readers as a must have before Halloween. The atmospheric creepy tone is topped off with lots of comfort foods for a perfect combination. 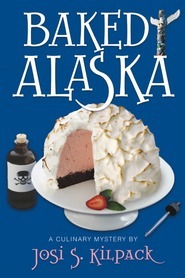 Now that I've discovered The Sadie Hoffmiller Culinary Mystery Series I can't wait for Banana Split coming in Spring 2012. Thanks so much to Deseret Book for sending me Pumpkin Roll!